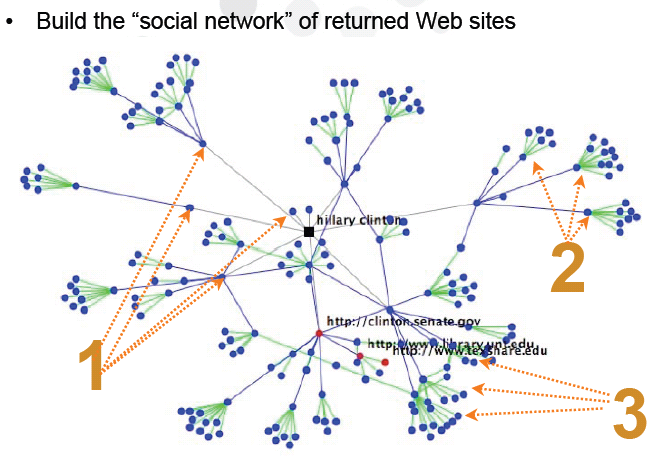 Trend Prediction = Search + Social Network Analysis? Basically, what Peter seems to propose is to use Google search for constructing ego-centric networks of websites related to a specific search term. Subsequently (described in the full article) he calculates the betweeness values (the number of shortest paths going through each node) for each of the websites in the network and calculates the average of this, something like the “popularity factor” of a search term (Peter doesn’t really call it like that – but this seems to be the intention). Peter speculates that this might be helpful to predict the outcome of elections, pick future Oscar winners or predict stocks. So what does this mean in terms of the phenomenon that Peter wants to observe? “Popularity” in Condor seems to be measured by averaging betweeness factors. The more the network deviates from the forest structure, the more “shortcuts” to navigate the forest are introduced, the lower the average betweeness factor becomes. This would mean that, for example, the movies with the highest average betweeness factors (i.e. more likely to get an Oscar) produced ego-centric networks that are closer to pure-forest structures than movies with lower average betweeness factors (i.e. less likely to get an Oscar). Since Google ranks websites (at least in part) with PageRank, this would mean that the most popular websites for an “Oscaresque” movie do not have extensive links among their neighbours in their ego-centric networks. This seems odd and somewhat counterintuitive, and I do not see an obvious explanation of this – any thoughts? It would also be interesting to conduct evaluations, for example comparing different network parameters, in particular clustering coefficient, in-degree and out-degree values to see how they would perform compared to average betweeness. I must say that my analysis might be flawed since it is unclear how many iterations with Google search were performed, and how many of the websites that are being returned are included, or how they are included (top level domain vs. specific sites) – all issues that would obviously influence the resulting graph. Peter (who also has a blog) was recently in Vienna, so it seems I’ve missed my chance to discuss his very interesting approach and my observations in person – something I definitely would have enjoyed doing. Mathias just announced that the proceedings of our CSKGOI workshop at the IUI conference are now available at the CEUR workshop proceedings server (CSKGOI Workshop proceedings CEUR-WS Vol-323). Thanks Mathias’ for putting all this together and thanks to everyone who contributed to this nice little event, which was an excellent occasion to discuss current research on commonsense knowledge and goal-oriented interfaces with like-minded colleagues. Mathias, Peter and I also presented some results of our own research that focused on studying the nature and structure of user goals in the AOL search query log – a log that contains more than 20 mio search queries. 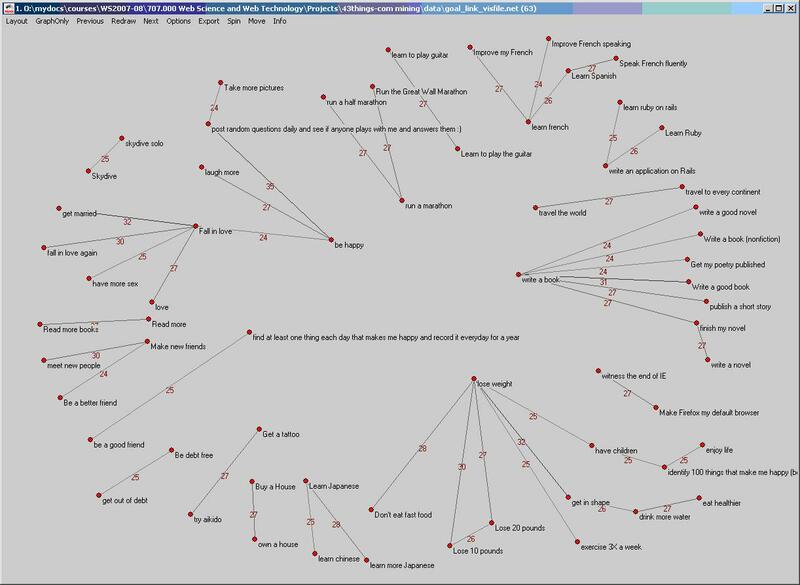 We used 43things.com API to crawl a minor set of goals and relations between them. The relations were inferred via a rather naive approach using simple weights for user- and tag- co-occurrences as well as 43things.com’s similiar-goal API call. Surprisingly, many of the strongest associations inferred are rather intuitive. Utilizing 43things.com’s API, this small exercise illustrates the potential of large socially-constructed corpora for collecting common sense knowledge (such as “fall in love” helps to “be happy” – as illustrated in the above screenshot). Making such common sense knowledge more explicit on one hand might help to aid users in formulating, progressing towards and satisfying their goals on the web, and on the other hand might help systems to identify, understand, assess and reason about users’ requirements and goals. So here we go – yet another blog injected into the blogosphere. With the blogosphere growing exponentially, I guess a new blog needs to provide at least some justification or an outline of its purpose. I intend to use the blog mainly to talk about issues related to my research on agents and social computation on the web. A sort of minimum requirement is that this blog should not contribute to worsening the signal to noise ratio in the blogosphere. Let’s see how that goes.